Add Card Media Reader: Adding a card reader means you can copy from SD, microSD, USB and CF Card directly to multiple target drives. Not compatible with Copy Protect or USB Connection options. The intelligent control centre burns to all 7 drives simultaneously, ensuring all your data is duplicated efficiently and cloned exactly as it should be. 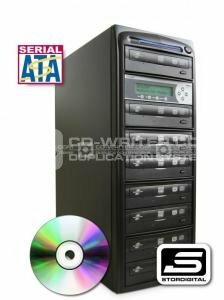 Designed as a dedicated duplication machine, the CopyTower operates completely independently. No PC or Mac connection is required for operation, simply plug in the power and you’re ready to duplicate discs in less than a minute. CD . DVD . Duplicator . StorDigital . Premium . CopyTower . 7 . Drive . 24X . 40X . Copier . SATA . Systems .